Heery's shop at 10 John Street, Waterford. There's a fine display of contemporary advertising in this shop window, all for soap products - Bodyguard, Restu, Kurlu, Gossages' Magical Soap - all made by William Gossage & Sons Ltd., Widnes, England. The posters against the wall are for Bodyguard soap, and include the information: "This shop will accept Bodyguard Cash Coupons in payment for any goods purchased here. 12 coupons are worth One Shilling." There was obviously a big push on these soap products at the time. 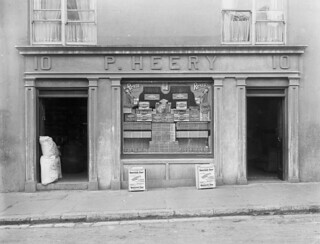 Another image from Waterford taken 8 days after this photo on 31 October 1922 has a similar window display.